iHome, the leader in award-winning speakers, portable devices and smart home control solutions, today announced the latest in its line of Bluetooth Speaker Vanity Mirrors, the iCVBT2, is now available for purchase online and in-store at Bed, Bath and Beyond and Amazon.com for $79.99. 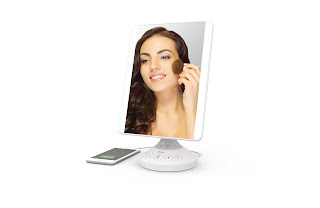 The features of this vanity mirror is 7”X9” flat panel mirror, the mirror has accent LED lights, the mirror is distortion free, Bluetooth audio with speakerphone, built in mic supports Siri or Google Now voice assistants, 1 Amp USB charging port for mobile devices, includes a cleaning cloth and 100V-240V universal AC adaptor, weighs a mere 1.61 lbs. and can come in black or white. My Opinion: This is a very nice mirror to look into and apply my make as when I wear makeup have to take my eye glasses off and I do not get close enough to the mirror to see and end up with uneven make up but now I do not have to worry. I also like how functionally this is along with charge my cell phone, iPod or other electronic devices into.